The ground-floor murals inside Wat Nong Wang's Phra Mahathat Kaen Nakhon stupa show both Khon Kaen history and Isan culture. This twin theme was suggested by the abbot, Phra Tama Wisut Tajan, and the murals were painted by local artist Kru Thammarong Kawboran. My thanks to Kru Thammarong for discussing the meanings of the pictures, and pointing out some of the specific things depicted in them – many have fun little scenes hidden in plain sight. The historical information mostly comes from the book The History of Khon Kaen by Kru Bramuan Pimsen (ประวัติศาสตร์เมืองขอนแก่น โดย ครูประมวล พิมพ์เสน). Some other information came from an old book called History of Khon Kaen City, The Best Things of Khon Kaen, Local Customs and Way of Life that used to be sold at the temple, but has since gone out of print. If the historical information here piques your interest, you may enjoy reading about Khon Kaen’s Seven City Pillar Shrines. You can also read about the "kalam" mural paintings on the second floor. The first picture is in the southeast corner, diagonally across from the information desk. The first twenty mural panels tell a brief history of Khon Kaen city. This is not a complete (or fully chronological) history, it just explains each of the episodes that are shown in the paintings. (No number) Ban Cheelon in the Present. This is a picture of a temple in Ban Cheelon village (At-Samat district, Roi Et province) the way it looked around the time that Phra Mahathat Kaen Nakhon opened. The celebration depicted is Boon Pha Wet (see mural #30), which Roi Et is known for celebrating in a big way. (1) Ban Cheelon's Landscape in the Past. In 1778, Pia Mueang Paen (Thao Paen), along with about 330 people, migrated from Toulakhom, just north of Vientiane, Laos, to what was then called Mueang Suwannaphum in Thailand. The spot where he stayed in now Ban Cheelon. (2) The Caravan Leaving Suwannaphum. In 1789 Pia Mueang Paen and his group left Suwannaphum and headed west. (3) The caravan Traveling through what is now Maha Sarakham Province. Pia Mueang Paen's daughter had been taken as one of King Rama I's minor wives, and she suggested that her father separate from the others and settle a new town. So he felt confident that he would get eventually get royal endorsement. (4) Camping During the Journey. The journey was not easy and campsites had to be found near water. (5) Arrival at Bueng Bon. 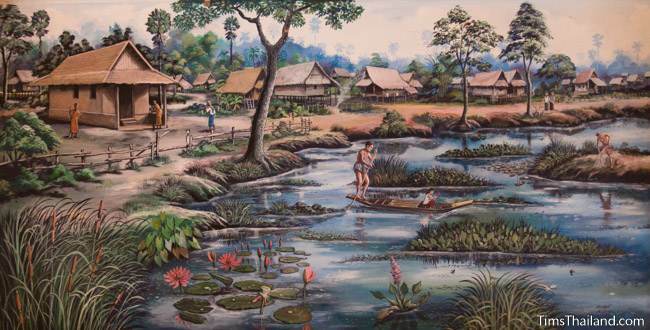 When Pia Mueang Paen arrived at Bueng Bon, the lake that is now called Bueng Kaen Nakhon, he saw that it was a fertile place with forest, good soil, plenty of water, and lots of fish making it appropriate for a new town, so he settled on the west shore. He named the town Ban Bueng Bon. The name Khon Kaen came later. (6) Messengers Delivering an Official Request to the Governor in Khorat to be Upgraded to a City. In 1796, having paid tax to the regional governor in Khorat for eight years, the people petitioned King Rama I to upgrade them to a formal city. (7) Reading the Official Proclamation. The official letter confirming the formation of Mueang Khon Kaen was delivered soon after. According to legend, Pia Mueang Paen's daughter helped influence the approval. She had become one of King Rama I's favorite concubines because one night she was the only one bold enough to wake him up from a nightmare. She used the Isan method – biting his toe – which earned her the nickname "Lady Tiger." (8) Ceremony to Bless the New City. The King's proclamation had named Pia Mueang Paen as the city's ruler, but he died before it arrived. His son-in-law, Thao Kam Bong, was chosen to be the new leader. In 1809, because of a territorial squabble with the leader of Chonnabot, the town moved to what is now Ban Non Mueang in Kosumphisai district, Maha Sarakham province. At that time it was called Ban Don Pan Chat. The city moved back to Bueng Kaen Nakhon in 1838, this time locating on the northeast shore at what is now Ban Nontan. In 1868 Khon Kaen split in two. A leader named Thao Ou, moved his followers five kilometers south to Ban Don Bom along the Chi River while the rest remained at Ban Nonton. During the Haw Rebellion in 1875, Thailand sent troops from many Isan cities, including Khon Kaen and Ban Don Bom, to fight the Chinese bandits who were wreaking havoc to the north of Thailand. Thao Ou's troops fought well and so in 1877 his town, sometimes called Khon Kaen Two, got royal recognition. (12) Ceremony to Present a White Elephant to the King. In 1897 Thao Ou got a white elephant from his wife's relatives in Kalasin and in 1900 had it presented to the king. Thao Ou received a high royal rank at this time. In 1881 the government ordered Khon Kaen to move to what is now Ban Thum, about 15 kilometers west of Bueng Kaen Nakhon, because it was along the Bangkok-Udon Thani ox-cart road. Ten years later (1891) Thao Ou moved his people to Ban Thum and the two Khon Kaens were reunited. (14) Return to Bueng Kaen Nakhon. Suffering from a drought in 1899, Khon Kaen moved back to where it began on the west side of Bueng Kaen Nakhon, the area now known as Mueang Kao ("Old Town"). At that time, the lake had many little islands as shown in this picture. What is not shown in the picture is that this part of the shore had many coconut and betel trees. (15) Khon Kaen's First Provincial Hall. After 1908, due to frequent flooding, government buildings and many people moved away from the lake to Ban Phralap, where Banglamphu Market is today, and this became the city center. The first proper provincial hall was built here. (16) Kok Kae Ow Market. By this time the city was developing fast. There was a big rice mill and many shops. People brought handicrafts and other goods from other villages by ox cart. (17) Old ubosot and Sala at Wat Nong Wang. Before 1947, Wat Nong Wang covered just 1.1 hectare (it is 4.5 hectares today) and the ubosot (ordination hall) was only four meters by six meters. There was a large sala similar to the one in this picture. (18) Khon Kaen Train Station. Khon Kaen's train station opened in 1933 and it boosted the city's economy greatly. (19) Khon Kaen's Second Provincial Hall. The provincial hall burned down in 1948 and a new one opened in the same place in 1949. Municipal offices were on the ground floor and provincial offices were on the second. The king and queen stayed here during their visit to Khon Kaen in 1955, which is what is shown in this picture. The building was demolished in 1983 and the Banglamphu Market opened in its place. (20) Khon Kaen Governor's Residence. The governor's residence was once located in the area that is now Sanambin School. When a new residence was constructed in 1920, this building was converted to a school building. These three historic sites around Khon Kaen province are popular tourist destinations. The largest Khmer temple ruin in Khon Kaen province, the 12th century Prasat Puay Noi has three central pagodas made of brick and sandstone. Many of the original carvings are still in place. Also known as Ku Ban Nakham Noi, this small Khmer ruin was the Buddhist temple for one of the many hospitals King Jayavarman VII built across the empire in the late 12th and early 13th century. (23) Phra That Kham Kaen. The holiest Buddhist site in Khon Kaen province, the classic Isan-style stupa at Wat Chetiyaphum dates from the 16th or 17th century and holds a relic of the Buddha. Next to it is a century-old ubosot. Murals #24-52 about Isan Culture are on the next page. Tim: Great job on this! KK history is not easy to find in English / western languages on the internet. Thanks. I will be adding some more about Wat Nong Wang over the next year.